Though it sometimes happens, actually it isn't often that a tragedy inspires a place name. Nevertheless the incident which occured at Calico Island in the Saskatchewan River in 1872, seemed pretty grim at the time. The owners of the first river steamer, no doubt, considered it tragic enough one spring when their new ship went to pices in the rapids there. Oh, to have seen those husky sailors rescuing the large cargo of coloured muslin they had aboard, for trade. Talk about sports of all nations! A festive spectacle indeed: grand and gay for the squaws as they squatted round to watch it. Fancy seeing hundreds of yards of coloured calico—hundreds of it—all being shaken out and stretched coquettishly by the crew, all over the island to dry. Just good clean fun! (though a maddening job for the owners.) Surely somebody broke down and enjoyed it. Surely some of those harassed he-men laughed out loud at this novel showing of spring calico for the Indians. People, probably, still smile as they sail past Calico Island. In Manitoba place names seem not to have marked so many incidents as the Alberta names. In the early days they may have been wilder and woollier farther west. Yet, Bull Island in Little Playgreen Lake, in Manitoba certainly marks a gruesome occurence. In 1836, at the HBC post at Norway House, Thomas Isbister the Scottish Postmaster, aged 42, was gored to death by a bull. His young wife (still in her twenties) horrified at the tragedy, must have been still further shocked when the men at the post finally corraled the brute that had wreaked such havoc, when her husband had tried to drive it out of the quadrangle; for seeking vengeance they tied the monster fast, dragged him to a nearby island, and burned him alive. Since the death of Thomas Isbister, the Scottish Postmaster, this small island near Norway House has been known as Bull Island. Premier Douglas L. Campbell of Manitoba likes people to know that a small island near the popular summer resort of Delta, not far from Portage la Prairie, is called Flee Island—not Flea. And he should know because he was born there. After the Minnesota massacre in 1862 the unpopular Sioux Indians escaped from the Dakotas, in the United States, and migrated into Manitoba. Claiming the protection of Queen Victoria, whom they called the “Great White Mother,” they established themselves in a fortified camp on what became known as Flee Island. However, until 1873, the Red Lake Indians from Minnesota, continued to terrify the Sioux who had fled to Flee Island. According to the folklore of the district from time to time they would make their way through the surrounding swamp, kill and scalp their prey (even going so far as to mutilate the corpses of. their unfortunate victims) before they could be driven back through the Flee Island marshes—back to their own stamping ground. One of Manitoba’s ghost towns. 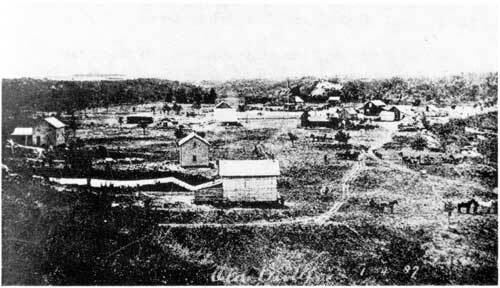 Millford in the 1880s stood on the Souris river near its junction with the Assiniboine. When Millford did not obtain a railway line the place became deserted and not a building stands today. For the story of another ghost town see here.